The film The Steppe Man by Azerbaijani director Shamil Aliyev was shot at the film studio Azerbaijanfilm in 2012. The authors of this poetic parable deal with the question whether absolute freedom is a form of human hopelessness and try to show that, when personal freedom comes into contact with society, it turns into a mirage. 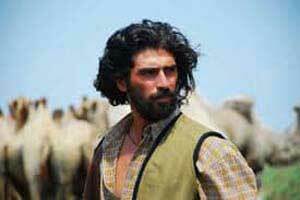 The Steppe Man is not Aliyev’s first film to be devoted to the subject of internal and external freedom (visibility of freedom) of man and the opposition of spiritual freedom with society. In his first feature film, The Confession (Etiraf, 1992), Aliyev also investigated the concept of internal and external worlds, when a person seems free, but internal conflicts prevent them from leading a normal life. Azad, the protagonist of this psychological thriller based on the novel The Thief and the Dogs (1961) by the Egyptian writer Naguib Mahfouz, is engaged in theft for a secret organization of which he is a member, until he is arrested. When, after a four-year sentence, he is released from prison, he sees that his wife and friends have betrayed him. He rejects the love offered and decides to revenge the traitors, but each time he kills innocent people by mistake and eventually is driven to suicide. Azad (which means freedom in the Azeri language) cannot leave the past behind: it spiritually fetters him; therefore the newly found freedom turns for Azad into captivity and destroys him. The short film Accidental Meeting (Tasadüfi görüs, 1999) tells the story of a man and a woman who meet after many years of separation, and concerns almost the same topic: the past has changed both protagonists—the woman is now the owner of a large company and the man sells newspapers in the street. Having met by chance, the woman tries to remind the man of the past, but he pretends not to know her. And when she insists, he gets tired of the game and hangs himself. Once again, the fetters of the past destroy him. The Steppe Man is Aliyev’s second feature film and offers his view on the subject of freedom from a different perspective. The events take place in the steppe. 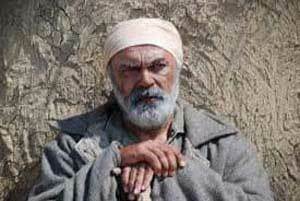 An old man (Vidadi Gasanov) and a young guy (the audience never fully comprehends whether they are really father and son, or two people who offered shelter to the other), live far away from the people, in the steppe, selling the wool of the camels they look after. 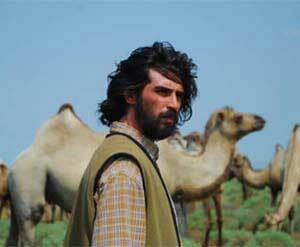 After the death of the old man, the younger guy remains in the steppe alone with the camels. One day a beautiful girl comes into his life and everything changes. The man starts to derive pleasure from the changes, and prepares to become a father, but then he unexpectedly learns that his woman is pregnant from another man. He stands before a choice: to accept the new reality, or not. The Steppe Man begins with frames of the gray steppe, bare thicket and camels, showing the infinite loneliness and silence of the location. The whirlwind stirs up dust and sand from the ground for some moments and then disappears again—a sign of eternal inertia: there is nothing that can break this stalemate. Even the father and the son living in the steppe… Actually they not father and son, but two strangers doomed to live together in the eternal dullness of the steppe. One of them is called Ulu (in Azerbaijani this means the eldest), and both by name and his tired face he represents the endlessness of this grey eternity. The other is called Steppe Man (Bakhruz Akhmedli): he has no proper name. When the young lad persistently asks after his name, he hears in reply only “Steppe Man.” The lad’s persistence reveals his desire to have a name and an identity. In infinity all people are identical, and there are no names. The little Steppe Man goes into the backyard to urinate; when he emerges from there, he is already an adult. In this infinity, tomorrow is the same as today. But one day death comes, and brings along with it—the woman (Salome Demuria). The woman is a symbol of the end, also the end of inertia; Therefore she also represents a beginning—of a new life. The woman means movement. 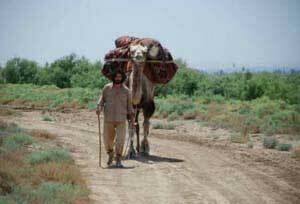 She gradually takes away everything that belongs to the Steppe Man: his bed, the house, the gun, the camels, and finally his loneliness. The woman lures the Steppe Man into a trap, and turns him into Ulu. Up to this point everything is fine, but although the film touches upon profound subjects, it doesn’t fixate the viewer. On the contrary, it forces the spectator to feel uncomfortable and restless, because the authors refute the information given subconsciously and they erase the hints that allow the viewer to understand the events on the screen. For example, this is an interesting episode: the female camel has just given birth and doesn’t allow the little one to come close. Then Ulu kneels before her and swears by bread and salt that the colt is her own offspring. This scene gives a clue to one of key plotlines. But in the following episode, the woman hiding in the hut is already pregnant, and the viewer receives detailed information immediately. Thus from the first minutes the surprise is annulled, and the scene where Ulu swears to the camel loses dramatic impact. Moreover, the camels who accompany the protagonists throughout the film stop being a dramatic element of the story and turn into ordinary camels, something exotic. They could easily be replaced with any other animal—a ram or a rooster—and nothing would change in the structure. The same applies to the legend about the hoopoe, which the viewer hears several times from the protagonists. The legend has it that, in ancient times, the hoopoe was a beautiful woman. She sat by the house every day and waited for her husband, who had gone away to earn money. One day the boss wants to take her by force. In order not to lose her honor, she begs God to turn her into a bird. God grants her wish and turns her into a hoopoe. Ever since then, she has been looking for her beloved to tell him about her innocence. From the very beginning the authors acquaint us in detail with the girl’s story, so that the fairy tale, which should become a poetic background for the screen events, turns the story into a parable; it also functions as the denouement and thus loses its significance. When it is repeated several times in the 80-minute film, it ruptures and slows down the film’s rhythm. The same applies to the images of the steppe and the Steppe Man: the steppe symbolizes boundless freedom, but those who live there are actually doomed by their freedom. Therefore the Steppe Man resists the appearance of a woman in his life; he does not want to lose his freedom. But all those details—the grayness, the thicket, the tired face of the protagonists—are used for the visual representation of the steppe and point not at freedom, but at doom. The steppe offers nothing to the lad in exchange for what the woman gives, so that we could understand and sympathize with the Steppe Man’s helplessness: by accepting the woman, the Steppe Man falls into a trap. Thus the conflict between steppe and woman loses importance, that is, it disappears from the outset. Similar comments concern the overall pace and the acting. The Steppe Man is shot in a slow, meditating rhythm: a minimum of words and actions. But in the scenes where Bakhruz Akhmedli and Salome Demuria play together, the rhythm is broken. Each of them is separately organic and suits the screen, but together they cannot catch the rhythm. They are more dynamic and more mobile, which stands out of the slow rhythm that the filmmakers try to keep from beginning to end. This break in pace distracts the viewer. In general, it seems that the filmmakers are not in control of the material in The Steppe Man but, on the contrary, the material manages them and drags them along. Therefore the viewer cannot dissolve in the film and empathize with what s/he sees on the screen. Cast:Vidadi Gasanov, Bakhruz Akhmedli (Vagifolgu), Salome Demuria, Vyusal Mekhraliyev, Dzhavidan Mamedli, Niubar Novruzova.